New beauty salons are opening at an unprecedented rate and the competition for clients is intense. Clients are now looking for socially responsible products that not only benefit themselves but the environment and the community. Questions such as; “Are your products vegan friendly?” and “Is the company you deal with socially aware?” are being asked by discerning clients. Now more than ever, it is important to give your clients a reason to return to your salon by ensuring you give them the best treatment with the best products available. With strip waxing being a core treatment for any beauty salon and with so many options on the market, features and benefits often become muddled in the sales pitch. Many salons are not taking the time to trial waxes before introducing them to their clients. In this article we will cover points to consider when choosing the right strip wax for you and your clients. Does it look and smell nice? Does it leave a sticky residue? What is the price per treatment? Does it drag on the skin when applied? Is it easy to heat? It is hot when applied? Are all the hairs removed? Does it contain quality ingredients? Is the product made in Australia? Is the company socially responsible? Have you used the product on yourself? Appearance and fragrance of the wax is just as important and the performance of the wax. Look for a wax which has a pleasant and appealing aroma as this is a scent that will fill your treatment rooms. Strip waxes have come a long way and no longer have an overpowering chemical odour. Just as the scent is important so too is the colour of the wax. You are now able to get a range of strip wax colours that are as colourful as a rainbow. Look for a colour and fragrance that suits you and your salon. Sticky residue being left on the skin after strip waxing is a problem for many salons. Even after you have applied and removed the strip the skin still feels sticky as though the wax still remains. Not only does this problem cause irritation to your client, it ultimately ends up sticking to the bed cover and creates extra cleaning for you. Although there are techniques to help avoid this problem, if the wax isn’t formulated correctly it will continually happen costing you time and money. When you apply your strip wax is it going on thinly? Strip wax when heated to the correct temperature should apply thinly and not drag along the skin whether you’re using a cartridge or spatula. When strip wax is applied thickly the cost per treatment increases as does the cost of the extra disposables needed to remove the wax. If the wax drags when being applied along the skin it adds to the discomfort of your client and increases the chance of them not returning. Heating strip wax is part of the preparation process when waxing. 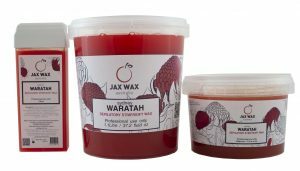 Is your current wax easily heated and can it fit effortlessly into your wax pot? Make sure you read the instructions prior to heating the strip wax as every wax is different and some waxes don’t need to be heated to such a high temperature, these wax types will greatly reduce the likelihood of burning your client. One of the most important features of any strip wax is; does it remove the hairs from the roots (including the fine ones)? As hair grows in 4 stages; Anagen, Catagen, Telogen and Exogen, it is impossible to remove all the hairs from the root. Look for a strip waxes that effectively removes the short and long hairs from the follicle without snapping the hair shaft. This will ensure that your client has a much better result from their waxing. As waxing is a method of temporary hair removal and under the Public Health Regulation 2012 is defined as a ‘skin penetration procedure’, it is vitally important that the ingredients used in the wax are of the highest quality. Ingredients such as titanium dioxide and some essential oils can help protect the skin, reduce redness and allow for easy application. Lavender Essential Oil, for example is known for its anti-inflammatory, anti-fungal, antiseptic, antibacterial and antimicrobial properties so when added to strip waxes it is beneficial to your client’s results. Clients are now making informed choices on where they go for waxing treatment depending on what wax they use. Take the time and look for a wax that is made in Australia and the company has a social conscience. Some companies are now manufacturing waxes that are vegan, cruelty free, paraben free and palm oil free. There are also wax manufacturers that are giving back to the community through empowering women by educating and supporting them. All these aspects are what your clients want to know so take the time to research and advertise these features to them. Salon owners who have recognised the marketability of waxing services are reaping the rewards by taking the time to research and test the waxing products they are using, similarly to the way they test skincare. Take the time to trial any new strip wax and don’t be afraid to try another brand, there are a lot of advancements in waxing and you may be missing out on something new in the market. Many wax companies provide samples of their strip wax, don’t be afraid to call them and ask. With a little thought and time, it is very easy to turn a standard wax service into a specialised ‘treatment’. Every wax ‘treatment’ should include the application of a quality pre-wax product, the use of a superior-grade wax, and finish with a soothing application of premium post waxing lotion or oil massaged gently into the treated area. This entry was posted in Waxing Tips and tagged Beauty Without Bunnies, Cruelty Free, Jax Wax Australia, male waxing, strip wax, waxing issues, waxing techniques, waxing tips.